1. ROBERT DAWES was born Abt. 1740, and died Oct 1792 in Diddlbury, Salop/Shropshire (Source: Jane Jones.). He married SARAH MANLOVE Nov 1763 in Upton Magna, Salop/Shropshire (Source: Jane Jones, marriage bond.). She was born Abt. 1742, and died May 1827 in Diddlebury, Salop/Shropshire (Source:Jane Jones.). i. ROBERT DAWES, b. 1764, Diddlbury, Salop/Shropshire (Source: Jane Jones, IGI P016181.). ii. THOMAS DAWES , b. 1766, Diddlbury, Salop/Shropshire (Source: Jane Jones, IGI P016181 for Thomas Dawes.). iii. SARAH DAWES , b. 1767, Diddlbury, Salop/Shropshire (Source: Jane Jones, IGI P016181 for Sarah Dawes.). iv. THOMAS DAWES , b. 1768, Diddlbury, Salop/Shropshire (Source: Jane Jones, IGI P016181 for Thomas Dawes 2.). v. ANDREW DAWES, b. 1770, Diddlebury, Salop/Shorpshire; d. Jul 1827, Diddlebury, Salop/Shorpshire. vi. WILLIAM DAWES , b. 1771, Diddlbury, Salop/Shropshire (Source: Jane Jones, IGI P016181 for William Dawes.). vii. WILLIAM MENLOVE DAWES , b. 1773, Diddlbury, Salop/Shropshire (Source: Jane Jones, IGI P016181 for W M Dawes.). viii. MARY DAWES , b. 1774, Diddlbury, Salop/Shropshire (Source: Jane Jones, IGI P016181 for Mary Dawes.). ix. EDWARD DAWES , b. 1776, Diddlbury, Salop/Shropshire (Source: Jane Jones, IGI P016181 for Edward Dawes.). x. RICHARD DAWES , b. 1778, Diddlbury, Salop/Shropshire (Source: Jane Jones, IGI P016181 for Richard Dawes.). xi. RICHARD DAWES , b. 1780, Diddlbury, Salop/Shropshire (Source: Jane Jones, IGI P016181 for Richard Dawes 2.). xii. SAMUAL DAWES , b. 1782, Diddlbury, Salop/Shropshire (Source: Jane Jones, IGI P016181 for Samual Dawes.). xiii. ELIZABETH DAWES , b. 1784, Diddlbury, Salop/Shropshire (Source: Jane Jones, IGI P016181 for Elizabeth Dawes.). 2. ANDREW DAWES (ROBERT) was born 1770 in Diddlebury, Salop/Shorpshire, and died Jul 1827 in Diddlebury, Salop/Shorpshire (Source: Jane Jones.). He married SUSANNA JONES Jan 1792 in Saint Peter, Worcester (Source: Jane Jones, IGI M043911. ), daughter of THOMAS JONES and ANN BROOKHOLDING. She was born 1770 in Worcester (Source: Jane Jones, IGI C043911. ), and died Jun 1841 in Aston, Warwick - age 71 (Source: Jane Jones, death cert.). i. ANDREW DAWES , b. c1792, Worcester (Source: Jane Jones, approx year of birth.). ii. SUSANNA DAWES , b. c1794, Worcester (Source: Jane Jones, approx year of birth.). iii. ANN MARIA DAWES , b. 1796, Worcester (Source: Jane Jones, approx year of birth.). iv. RICHARD BROOKHOLDING MENLOVE DAWES, b. 1800, Worcester; d. Mar 1844, Aston, Warwick - abt age 44.
v. ROBERT DAWES , b. 1802, Worcester (Source: Jane Jones, approx year of birth.). vi. ELIZABETH DAWES , b. 1803, Worcester (Source: Jane Jones, approx year of birth.). 3. RICHARD BROOKHOLDING MENLOVE DAWES (ANDREW, ROBERT) was born 1800 in Worcester (Source: Jane Jones, census 1841. ), and died Mar 1844 in Aston, Warwick - abt age 44 (Source: Jane Jones, death cert for R B M Dawes.). He married (2) FANNY HUGHES Aug 1825 in Sutton Coldfield (Source: Jane Jones, marriage cert. ), daughter of JAMES HUGHES and ELIZABETH. She was born 21 May 1797 in Sutton Coldfield (Source: Jane Jones, IGI P017351. ), and died 23 Jun 1842 in Aston, Warwick - age 45 (Source: Jane Jones, death cert.). He married (3) CATHERINE PRITCHARD Aug 1843 in Ellesmere, Shropshire (Source: Jane Jones, marriage cert. ), daughter of PETER PRITCHARD and ANNE. She was born Jul 1800 in Ellesmere, Shropshire (Source: Jane Jones, IGI C037421. ), and died Aug 1882 in Duddleston, Aston (Source: Jane Jones, death cert.). ii. FANNY HUGHES DAWES , b. May 1826, Aston, Warwick (Source: Jane Jones, IGI C011683.). iii. JANE DAWES , b. 18 Aug 1827, Duddeston (Source: Jane Jones, IGI C011683.). iv. SUSANNAH DAWES , b. Dec 1829, Aston, Warwick (Source: Jane Jones, IGI C011683 & census 1841.). v. ANDREW DAWES , b. 1832, Aston, Warwick (Source: Jane Jones, census 1841. ); m. CAROLINE AMELIA HANDS, Jun 1854, Aston Juxta, Birmingham, Warwick (Source: Jane Jones, IGI M011684. ); b. 1828, Birmingham, Warwick. vi. ELIZA DAWES , b. 1833, Aston, Warwick (Source: Jane Jones, census 1841.). vii. ROBERT DAWES , b. 1834, Aston, Warwick (Source: Jane Jones, census 1841.). viii. THOMAS DAWES, b. Dec 1836, Aston, Warwick; d. Apr 1896, Aston Road, Aston, Warwick - age 59.
ix. SARAH DAWES , b. 1838, Aston, Warwick (Source: Jane Jones, census 1841.). 4. THOMAS DAWES (RICHARD, ANDREW, ROBERT) was born Dec 1836 in Aston, Warwick (Source: Jane Jones, IGI C011682 & census 1841. ), and died Apr 1896 in Aston Road, Aston, Warwick - age 59 (Source: Jane Jones, death cert.). He married MARY ELLEN BROWN Dec 1865 in Birmingham (Source: Jane Jones, marriage cert. ), daughter of JOSEPH BROWN and ELIZA GOODHEAD. She was born Sep 1849 in Birmingham (Source: Birth cert. ), and died Jan 1933 in Birmingham - age 83 (Source: Jane Jones, will.). i. THOMAS BROOKHOLDING DAWES, b. Aug 1866, Garbett Street, Birmingham, Warwick; d. Nov 1945, Portsmouth - age 79.
ii. HENRYJOSEPH DAWES , b. 1869, Birmingham (Source: Jane Jones, census 1881.). iii. ELIZA EVELYN MAY DAWES , b. 1870, Handsworth, Stafford (Source: Jane Jones, census 1881, 1891.). iv. LOUIS JOHN DAWES , b. 1871, Handsworth, Stafford (Source: Jane Jones, census 1881, 1891.). v. FLORENCE ELLEN DAWES , b. 1873, Aston, Warwick (Source: Jane Jones, census 1881, 1891.). vi. KATE DAWES , b. 1875, Aston, Warwick (Source: Jane Jones, census 1881.). vii. ADA DAWES , b. 1876, Birmingham, Warwick (Source: Jane Jones, census 1881, 1891, 1901.). viii. CLARENCE GILES DAWES , b. 1879, Aston, Warwick (Source: Jane Jones, census 1881, 1891, 1901.). ix. MADELINE DAWES , b. 1883, Aston, Warwick (Source: Jane Jones, census 1891, 1901.). 5. THOMAS BROOKHOLDING DAWES (THOMAS, RICHARD, ANDREW, ROBERT) (Source: Jane Jones, birth cert for T B Dawes.) was born Aug 1866 in Garbett Street, Birmingham, Warwick (Source: Jane Jones, birth cert. ), and died Nov 1945 in Portsmouth - age 79 (Source: Jane Jones, administration document.). He married FLORENCE MARY MIRAH COLDICOTT Nov 1884 in Birmingham (Source: Jane Jones, marriage cert. ), daughter of FREDERICK COLDICOTT and ELIZABETH JONES. She was born Jun 1867 in Edgbaston (Source: Birth cert ), and died Jan 1929 in Southsea - age 61 (Source: Jane Jones, will.). i. ALBERT FREDERICK B DAWES , b. 1885, Aston, Sutton Coldfield, Warwick (Source: Jane Jones.). ii. FLORENCE CONSTANCE DAWES ), b. 1887, Aston, Warwick (Source: Jane Jones, census 1891, 1901.). iii. HARRY BROOKHOLDING DAWES, b. 17 Jun 1888, Aston, Warwick; d. 25 Nov 1968, 33 Wellsway, Bath, Somerset - age 80.
iv. GERTRUDE MADELEINE BLANCHE DAWES , b. 1890, Peasdown, Somerset (Source: Jane Jones, census 1891, 1901.). 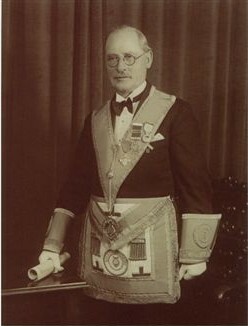 v. LOUIS PERCY B DAWES , b. 1894, Irnham, Lincon (Source: Jane Jones, census 1901.). vi. BRENDA MAY DAWES , b. 09 Oct 1895, Cogenhoe, Northampton (Source: Jane Jones, census 1901.). vii. MINNA VICTORIA DAWES , b. 09 Oct 1895, Cogenhoe, Northampton (Source: Jane Jones, census 1901.). viii. CLAUDE DAWES , b. 1899, Cogenhoe, Northampton (Source: Jane Jones, census 1901.). 6. HARRY BROOKHOLDING DAWES (THOMAS, THOMAS, RICHARD, ANDREW, ROBERT) was born Jun 1888 in Aston, Warwick (Source: Birth cert for H B Dawes. ), and died Nov 1968 in Wellsway, Bath, Somerset - age 80 (Source: Death cert for H B Dawes.). He married ANNIE CATHERINE NEWMAN Apr 1915 in Bath, Somerset (Source: Marriage cert for H B Dawes & A C Newman. ), daughter of WILLIAM NEWMAN and SARAH ROWE. She was born Oct 1886 in Eastville, Bath, Somerset, and died Apr 1972 in St Martins, Bath, Somerset - age 86 (Source: Death cert for Annie C Newman.). Residence: 1891, Southbourne Gardens, Bath, Somerset. i. BRIAN WILLIAM BROOKHOLDING DAWES, b. 03 Jun 1916, 12 Eastville, Bath, Somerset; d. 20 Jul 1993, St Martins, Bath, Somerset - age 77.
ii. KENNETH ALBERT BROOKHOLDING DAWES, b. 01 Jun 1919, Christchurch, Dorset; d. 26 Feb 2002, Bath, Somerset - age 82.
iii. WILLIAM ? BROOKHOLDING DAWES, b. 1925; d. Bath, Somerset - abt 5. 7. 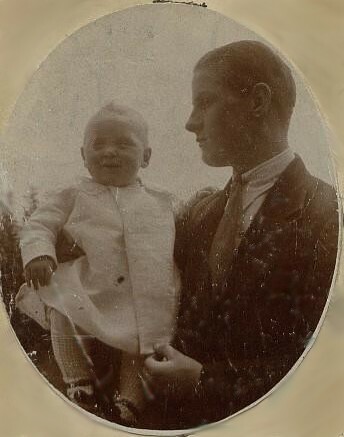 BRIAN WILLIAM BROOKHOLDING DAWES (HARRY, THOMAS, THOMAS, RICHARD, ANDREW, ROBERT) (Source: Birth cert for B W B Dawes.) was born 03 Jun 1916 in 12 Eastville, Bath, Somerset (Source: Birth cert for B W B Dawes. ), and died 20 Jul 1993 in St Martins, Bath, Somerset - age 77 (Source: Death cert for B W B Dawes.). He married (1) P M 1940 in Bath, Somerset (Source: Marriage cert for B W B Dawes & P M.). He married (2) SHEILA MACDONALD May 1952 in Bath, Somerset (Source: Marriage cert for B W B Dawes & Sheila Dawes. ), daughter of EDWARD MACDONALD and MILDRED ROBERTS. She was born Jan 1930 in Melrose Grove, Twerton, Somerset (Source: Birth cert for Sheila Macdonald. ), and died Dec 1984 in Forres, Morayshire - age 54 (Source: Death cert for Shelia Macdonald.). Residence: 1935, Encore, Mount Road, Bath, Somerset. He married (3) I F H 1976 in Bath, Somerset (Source: Marriage cert for B W B Dawes & I F H.). 8. KENNETH ALBERT BROOKHOLDING DAWES (HARRY, THOMAS, THOMAS, RICHARD, ANDREW, ROBERT) was born Jun 1919 in Christchurch, Dorset, and died Feb 2002 in Bath, Somerset - age 82 (Source: Death cert for Kenneth A B Dawes.). He married ELSIE GREEN Mar 1941 in Mapplewell, Yorks. She was born Mar 1915 in Mapplewell, Yorkshire, and died 2002 in Bath, Somerset.